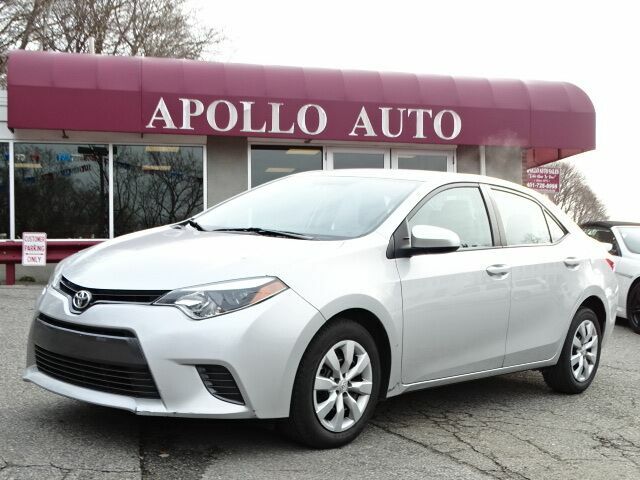 Remainder of Factory Warranty * Backup Camera * Bluetooth * Clean Carfax * Alloy Wheels * Entune * Contact Apollo Auto Sales today for information on dozens of vehicles like this 2015 Toyota Corolla LE. This 2015 Toyota Corolla has great acceleration and wonderful styling without sacrificing exceptional fuel economy. The Corolla LE is well maintained and has just 41,190mi. This low amount of miles makes this vehicle incomparable to the competition. More information about the 2015 Toyota Corolla: The Corolla has been volume leader for Toyota for several years, and the latest version offers buyers even more bang for their buck. In a crowded compact segment, against the Honda Civic, Nissan Sentra and Ford Focus, the new Corolla stands out for its fresh, athletic styling, as well as its roomy, feature-rich interior. The LE Eco even offers best-in-class fuel economy. Add Toyota's outstanding reputation for reliability, and the 2015 Corolla deserves a place at the top of every compact car-shopper's list. Interesting features of this model are standard features, Sporty looks, affordability, and reliability, fuel efficiency Apollo Auto Sales has been in Business Since 1972. We Specialize in Late Model-Low Mileage-Fully Serviced Vehicles. Apollo Auto Sales practices a Velocity Based Pricing Strategy which provides a Transparent Sales Process and Excellent Overall Customer Experience. Please Call Us to Check Availability and to Schedule your No Hassle-No Obligation Test Drive!! Call 401-728-8998 or Click: www.apolloautosales.com.